With the start of a new congressional season, a proposal has been made by Senator Mark Udall (D-CO) to change the rules about how the filibuster can be used in the Senate. Over the past fifty years there has been a gradual increase in the use of filibusters to bring legislative progress to a halt. 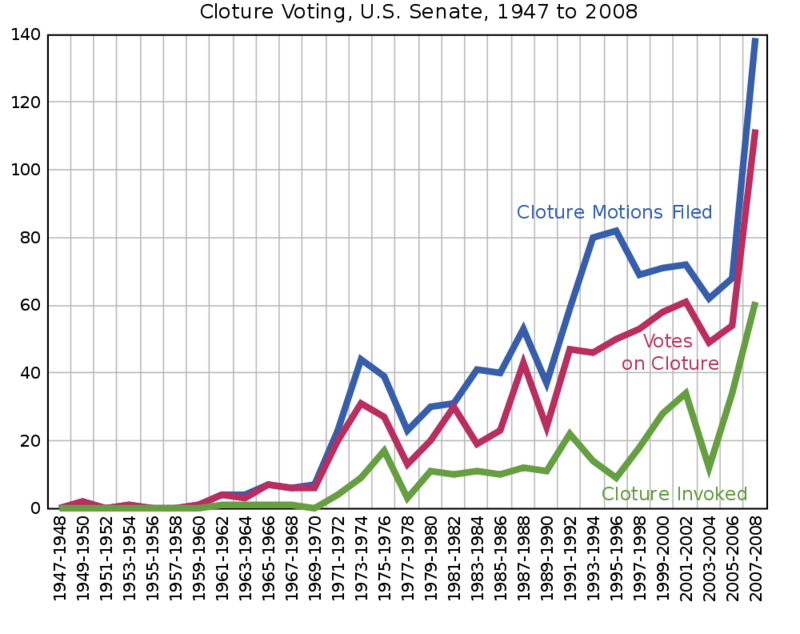 Filibuster use (as represented in the chart below showing the frequency of cloture votes to end a filibuster) has skyrocketed in the past decade. The Senate’s history as a calmer, more deliberative body than the House of Representatives is an important one to preserve, but filibusters have become more of a stalling tactic than a deliberative one and instead of protecting the interests of the minority, serve instead of hijack the interests of the majority to accomplish what they were elected to do: legislate. Doing my duty as an actively engaged citizen, I emailed my senators to let them know I am in favor of the proposed changes. One, Pat Roberts (R-KS), responded with a virtual filibuster. His email response explained that as a member of the Senate Rules Committee, he held hearings on this topic last year and is not in favor of any changes. “My statements are available on the committee’s website,” he wrote. On that page I found the link to download the 666-page Publication on the Filibuster Hearings Series. I’m glad Senator Roberts feels that the clearest and most effective way to summarize his objections to changing the Senate rules is to direct me to a 666-page document. And one wonders why so few Americans participate actively in civic life. This entry was posted in Uncategorized and tagged Filibuster, politics, Roberts, Senate, United States by christao408. Bookmark the permalink. Good for you that you’re an involved citizen. Boo to Pay Roberts or his aide who answered emails for his lazy response. Politicians are lawyers in disguise thats why everything that is done by them is so damn complicated and so hard to understand. I think they amuse themselves by playing games with their voters mind once they are in power. Its only when they want our vote that they come across as being very down to earth. Maybe there are a lot of graphics in that 666 page document. hahahaha…..
hence the reason nothing important seems to get done anymore. Excellent post and you hit an important item of why more people are not involved in government – the officials push the electorate away with answers like that. The only time they “want” to hear from the electorate is at election time. Then yes they will listen to get a vote. It takes an effort such as you made to reveal the stupidity or is it political wisdom of our elected officials. Such a simple solution, and quite fair. Just show up for the vote to be counted. It’s not even a radical change. I cannot say this about all politicians, but most of them love you only during the campaign season, and will go to all lengths to explain their stand and listen to what you have to say! @beowulf222 – When I saw the number – 666 – I did laugh at the funny coincidence. Or is it a coincidence? Bwa-ha-ha-haaaa! @ElusiveWords – @bengozen – Really, the length of the document would not be so bad if there weren’t margins on all four sides that exceed two inches! We could save a lot of trees just by adopting the standard one-inch margin used by, say, everyone else. @Fatcat723 – @ZSA_MD – @The_Eyes_Of_A_Painter – I think you captured the essence of it: a politician only really wants to hear from his or her constituents when there is a donation in hand. @ordinarybutloud – Oh, I can explain why your eyes glaze over. It is because you know that the politicians are playing games rather than doing their work. Imagine if you tried to “filibuster” at your own job! =D@everyday_yogi – I agree, I think Senator Udall’s proposal was really quite modest: limit filibusters to the actual vote on the bill itself, not to whether or not to even debate the bill, and require senators to be present when filibustering. No virtual filibusters. @twentyse7enn – There seem to be two good techniques to keep people from getting involved: use incomprehensible language (legalese) and spread lies and fear instead of facts. They work wonderfully to keep all of us from being informed and engaged. @awoolham – I think I would be more involved if it was easier to get information. One site that makes it pretty easy is the non-partisan OpenCongress.org. @LostSock21 – The more filibustering, the less legislating. @murisopsis – And they accuse the US government of being wasteful. Pish-posh! One of the stupidest things we ever did was to amend the constitution to change from allowing the state legislatures to appoint senators to direct popular election. A huge mistake that maybe we will rectify one day. @Toro69 – I never thought about that aspect of it before, but it would seem that you would have a bit more decorum with Senators appointed by state legislatures. Interesting… Personally, I think we should more to a parliamentary system.